My maternal grandfather was pure German, born in Michigan. My maternal grandmother was pure Dutch, born in Michigan. My father’s parents were a bit different. Grandpa Yonker was pure Dutch, born in Michigan but it was his mother that held real excitement for me when I first began to ease down my branch of the tree. Vada Mellen was born of Anglo-Saxon ancestry. It was that hope of finding a Revolutionary hero, perhaps even a Pilgrim that led me into this interest! It was not difficult to determine the parents of Vada but in finding their marriage record, there began the work that continues even now. Searching through Ottawa County was fruitless but as I moved out into neighboring counties, I found them … in Allegan County. It made sense, the section of that county where they lived was directly south of the Hudsonville area, the place where my grandparents lived and where my father was born. The attached page from the Allegan County marriage register states that Frank M. Mellen was a painter, then 41 years old and had been born in New York. His parents were listed as Livonia Meigs and Atchison Mellen. He had been married twice before. Carrie E. Pierce Kelly was 31 years old and was born in the State of Vermont. Carrie’s father was named James Pierce but her mother’s name was unknown. She had been married once before. Both were living in Salem at that time. 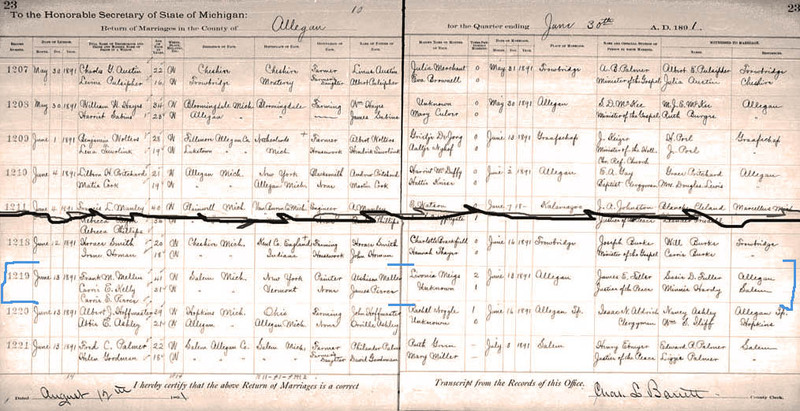 The register (above) indicates that they received a license and were married on the same date, 13 June 1891, in Allegan by a Justice of the Peace, James E. Fuller. It appears that one of their witnesses may have been related to the Justice of the Peace while the other, Minnie Hardy was a friend or relative from back in Salem. Several questions entered my mind after reading the document; some have yet to be answered. I get side-tracked! I get busy on one branch of the family when out of the blue, something interesting pulls my attention into a different direction. There are a few things that I must still investigate: 1) Frank Mellen had been married twice before. I have found his marriage with Eva Young in Kent County but not the other, 2) who was Minnie Hardy, the witness from Salem? 3) Carrie Pierce was born in Vermont, her first marriage was also in Vermont. How did she get to Allegan County, Michigan? why? Tracking the Mellen family back into New York State has been a challenge, to say the least! I have hit “the brick wall.” I take a whack at it every so often but it is pretty big! My experience with the Pierce family has been the direct opposite. It was one of my early adventures, back in the 1980s, and it has proven very exciting; eastward to Vermont, then back into Colonial Massachusetts, and finally…back across the Atlantic in the early 1600s I will share that with you, bit by bit.